This is a recap of my personal race experience. If you’d like more nitty gritty details, you can check out my Bibrave.com review by clicking here. When: Saturday May 2, 2015. I didn’t realize it when I signed up, but this race has apparently been going on for almost 40 years, which is pretty cool. It was also my first 5 mile race, and I’m glad it was. Pre-Race (Registration, Pick-up, Facilities etc): This is a very no-frills race. Registration was $10, and you could pre-register online, or do race-day registration. There was plenty of parking at Jericho Elementary School, and 2 portable toilets were available to runners. About 5 minutes before the start, I walked over to Old Pump Rd (just across the street) to line up. There were some quick announcements, and then we were off. During the Race: I started my Garmin when I started running, not when I crossed the finish line, because there was no chip-timing, just “gun” time. Old Pump Road is a great dirt road with rolling hills and lots of beautiful scenery. It was warm and sunny, but thankfully not hot, and the road was well-shaded in most areas. The route was out and back, which meant that we hit the water stop twice. It was around the 1.75 mile mark going out, and I walked a bit with my water. I felt good, but a little sluggish. Right after the water stop, I caught up to a woman I’d been following for a while. We got to chatting, and her name was Dana. I stayed with her for about a half mile, and it felt really nice to make a friend out on the course. After a while, she let me know that I was going a bit too fast for her, so she dropped back and I kept going. The first half was overall uphill, and the second half was overall downhill, so I really just tried to let myself go on the downhills to make up some time. I walked the water stop again, because I had been going a bit too fast and was feeling tired. By mile 4 I was dragging quite a bit, and ready to be done. I managed to pass another couple of women right before the end, and sped up to cross the finish line. Post-race: I was feeling a bit pukey, so I walked a couple of laps until I felt better. There was a truck parked right at the finish line that had big bottles of cold water in the back, so I grabbed one while we stood around chatting. Ben came to watch, and our friends Emerson and Lori also ran. They’re speed demons–Lori was the fastest woman overall and Emerson took first in his age group! 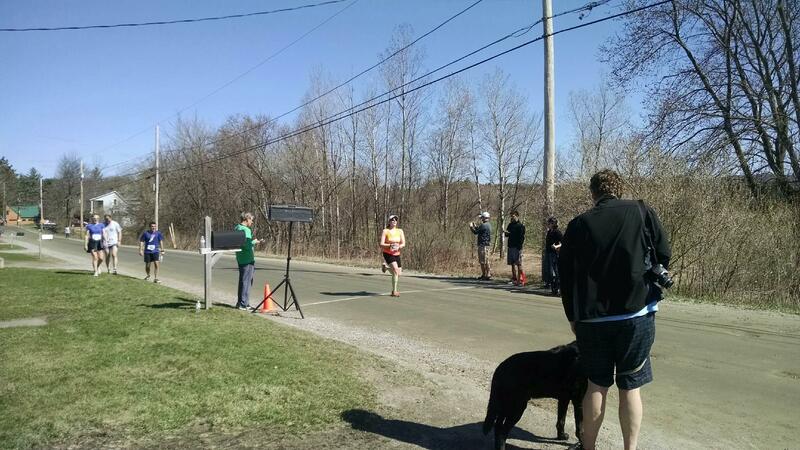 I was also able to cheer my new friend Dana across the finish line, which was super cool. Back at the elementary school, there were bagels with peanut butter and/or cream cheese and bananas, which I thought was perfect. GMAA had some very nice prizes–Snowflake Chocolates, Road Crew Crunch granola, a fresh-baked pie from the Poor House, t-shirts, gift cards and more. I was pleasantly surprised by the number and quality of the prizes for a race with a $10 registration fee. Only walk while drinking water–Check! I was very pleased with how this race turned out. It was a beautiful day, and the course was absolutely gorgeous. And of course, I got my hard-earned maple creemee after, so who could be upset with a race that ends like that? I’m excited to hopefully do another 5 mile race soon, and I know I’ll be running this one every year. Have you ever done a 5 mile race? What did you think? Awesome job on your race! That’s a great time. I love 5 milers! One of my favorite distances to race. We have a local one in our area that I try to do annually. Last year, I did one at the beach in July – it was super fun. It was definitely a great distance. I’m trying to find others in my area. 5 milers are definitely an odd distance – there is a Corning GlassFest 8k coming up later in May I might do again if schedule allows (just shy of 5 miles). That’s exactly how I felt too! At about mile 2.5 I was like, whee, this is awesome! And then I got too hot. Hopefully I’ll acclimate to the heat soon! Great job out there and way to finish strong! That’s so awesome! (Despite the pukey feeling at the end…I hate that!) 5 milers are one of my faves and I’m so glad you had an overall positive experience with it! Thank you! I think it’s my new favorite distance. I just wish it were more common. Congrats on meeting all your goals!! $10 for a 5miler! What a bargain. Thank you! It was definitely a good value. Sounds like a great race and a great race day! You ran it just the way you wanted and had a fantastic time–what more is needed?! 5 miles is such a great distance.! never done a 5 mile race though. great job and way to reach all of your goals.!! Thank you! I highly recommend the 5 mile race distance–it was awesome. Great job! I’ve never run a 5 miler race before. Sounds like a fun event! Great race!! I like the idea of 5 miles- less brutal than a 5k but not as long as 10K- less time to hang on . I’ve done one trail 5 miler. It was fun. That sounds like a speedy crowd you ran with, too. Congrats! Yes, they’re a bunch of speed demons for sure. Something to strive for, I guess! Congrats on a great race and hitting all your goals!! I’ve done a 5-miler before but it was almost 3 years ago. I have no idea how I would pace for it now though. I guess just a little faster than 10k pace?? That sounds reasonable! I really enjoyed the distance.